We could all use a boost. 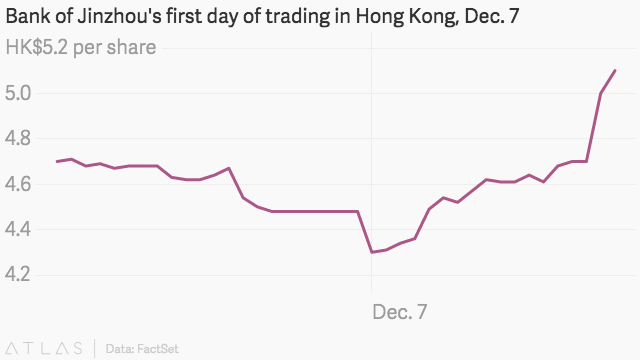 China’s Bank of Jinzhou started trading in Hong Kong today (Dec. 7), and its shares closed up with a healthy 8.5% gain. This is despite the bank’s close ties to under-investigation Hanergy Thin Film Power, the fact that China’s banks are being probed by regulators at a frantic clip, and Jinzhou’s inability to attract long-term corporate investors known as “cornerstones” in Hong Kong. Bank of Jinzhou is owned by the local government in the northeastern province of Liaoning, but it is impossible to say at the moment what was responsible for the bank’s end-of-day pop. Still, the hints of Beijing-style manipulation in Hong Kong, which recently opened to mainland Chinese investors, are hard to ignore.